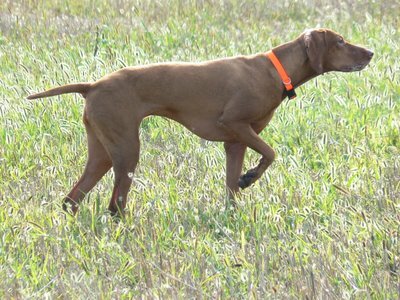 Zoe’s second breeding was to Digger (Hubertus South Pacific from Australia) also owned by Nancy and David Heinold of Paradox Kennels. We kept one of her daughters (Maggie, Adrians Dreamshadow FDJ) born in 2002. Maggie like her mother preferred field work to the show ring. She has her FDJ. Unfortunately Maggie became gravely ill at 9 months of age and she recovered however her immune system was never the same. We suspect that she had a vaccine reaction and she was never bred. 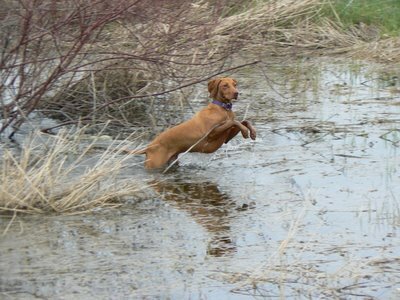 She loves living in the country hunting and running it the fields. Mostly she sleeps in her raised dog bed enjoying the warmth of the fire in winter and sunshine in the summer along with being the matriarch of our pack.